Not many buildings in Malaysia are Green Mark or Eco Friendly. Aeon Bukit Indah is one of these green buildings in Malaysia. It has made use of solar panels to generate power for its own usage. The PV System can generate an estimate of 1,880 kW. These PV Systems can be coonnected to air handling unit (AHU) or to fluorescent lighting in Aeon case. This will help to reduce the carbon foot print and save earth precious resources and green gas emitted. Preventive Maintenance on these PV Systems are require in order to ensure that the system will continue to function according to its ability. 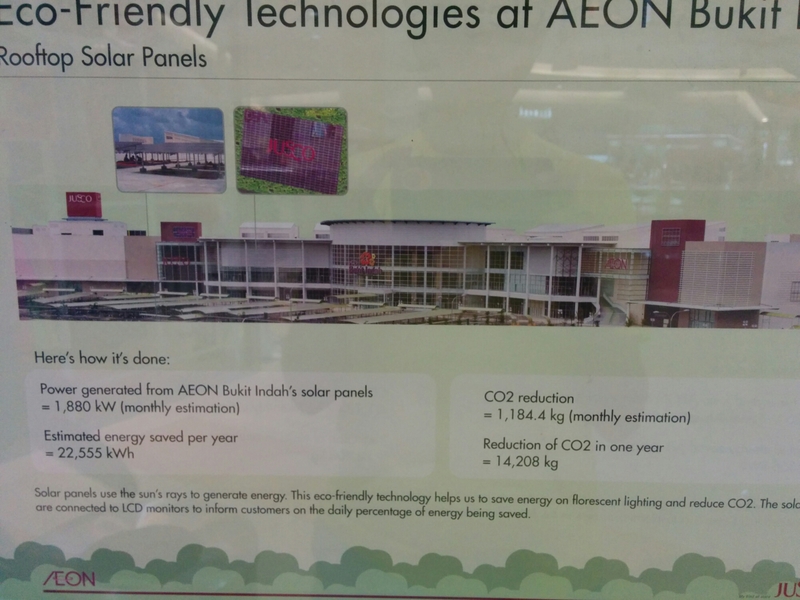 The system will definetly help to reduce the electricity bill of Aeon Bukit Indah. Japan has always been an advocate of eco friendly concepts. Therefore they will be able to help Malaysia to move towards a greener environment.